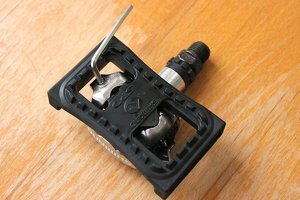 My bicycle came with SPD pedals with platform adapters already installed. 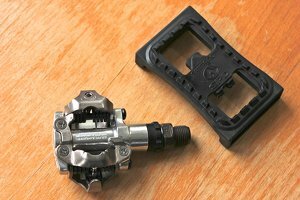 This allows you to use regular shoes on one side of the pedal and cycling shoes with SPD-cleats on the other side. They also have built in reflectors which is required in some countries to ride at night. It seems ideal, but is really a compromise. I would only recommend platform adapters if you ride with SPD-shoes most of the time. The platform is relatively small, easy to slip off, and because it is heavier usually ends up facing downward when you remove your feet. If you ride with regular shoes most of the time I can recommend the Shimano PD T-420 pedals. These have a much wider platform and tend to fall with the platform side up. Removing the platform adapters from the pedals can be very hard. However, it is relatively easy if you follow these steps. This procedure works with the pedals both off or on a bicycle. 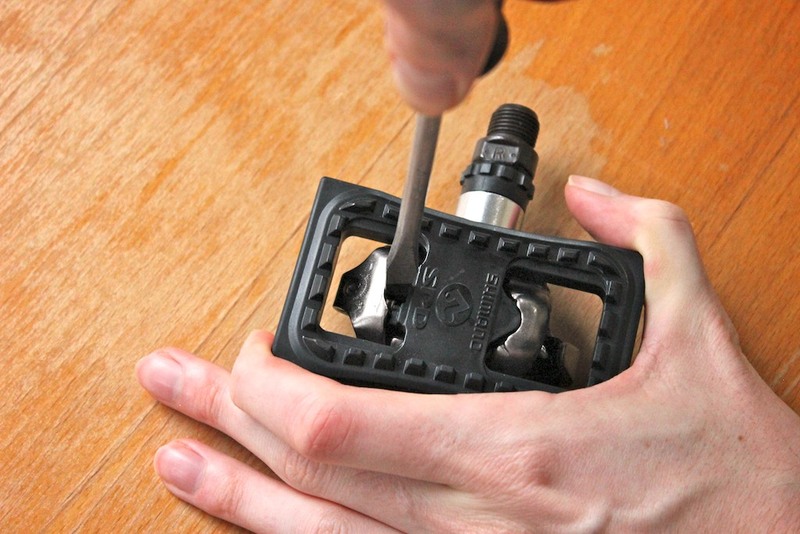 Loosen the spring on the platform side with a hex key. 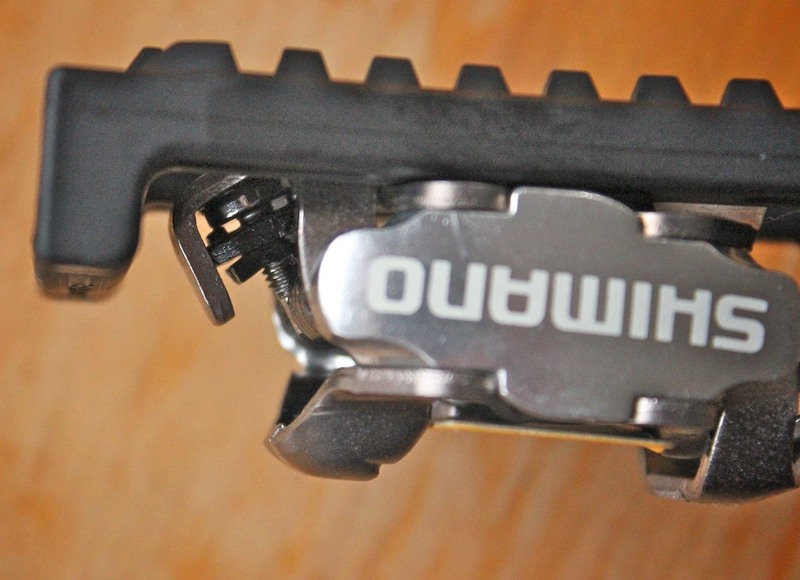 The first step is to loosen the spring as much as you can with an hex key rotate it in the direction of the minus. You only need to do this for the spring on the side of the platform. If the spring is touching the top screw it is at is loosest. 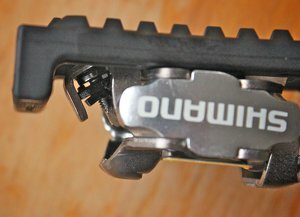 By looking at the side of the pedal you can see how far along the adjustment screw the spring is. Insert a flathead screwdriver of appropriate size. The next step is to get an appropriately sized flathead screwdriver. Bigger is not always better here. Get a screwdriver that fits best in the gap. Hold the pedal and turn while pulling out the platform. Hold the pedal firmly with one hand and rotate the screwdriver to push the pedal open. You can now pull the platform adapter right out. The platform should come off without much effort. 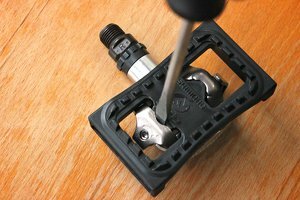 The pedal used here is a Shimano PD M520 with a SM-PD22 platform adapter. This technique should work with similar SPD pedals. If the pictures were not clear enough, a reader inspired by this article made a video showing how it's done.